Laura Michaud has been in the family business member's shoes as a third-generation family member in her family's business, Beltone Electronics. For nearly two decades of working with her family, she learned first-hand the challenges that come with family business communication. 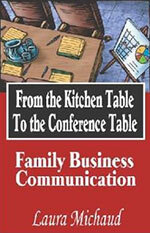 And she wrote about it in a defining book entitled From the Kitchen Table to the Conference Table: Family Business Communication now available on Amazon! This book is impactful and gets right to the point. You will be able to read it and put its practices to work immediately. Order now! Laura publishes a must-read online newsletter. In The Family Business Insider, a quick read, tip-oriented eblast, you will find tips, ideas, and important information that family businesses and their members need for survival and harmony. Sign up Now to Start Benefitting!